France is braced for renewed anti-government protests, with nearly 90,000 security personnel on the streets. 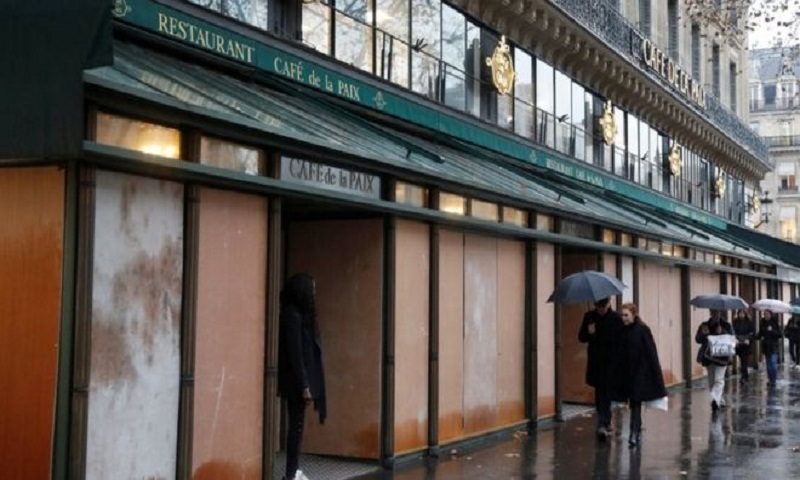 Some 8,000 officers and 12 armoured vehicles will be deployed in Paris alone, where shops have been boarded up and sites like the Eiffel Tower closed. The "yellow vest" movement began three weeks ago in opposition to a rise in fuel tax but ministers say it has been hijacked by "ultra-violent" protesters. Last week saw hundreds arrested and scores injured in violence in Paris. They were some of the worst street clashes seen in the capital for decades. What is likely this weekend? The authorities are certainly not underestimating the threat. There were 65,000 security officers across the country last weekend and that has been increased to 89,000, even though Interior Minister Christophe Castaner said he expected fewer protesters than last weekend, perhaps about 10,000 nationwide. He said: "10,000 is not the people, it's not France." The security forces will want to prevent a repeat in the capital, where the Arc de Triomphe was vandalised, police were attacked and cars overturned and burned last weekend. Mr Castaner has vowed "zero tolerance" towards violence. He said: "According to the information we have, some radicalised and rebellious people will try to get mobilised. Some ultra-violent people want to take part." Mr Castaner added: "These past three weeks have seen the birth of a monster that has escaped its creators." Some calls on social media for attacks on police and the Élysée palace in an "Act IV" drama have been unnerving, as was the receipt of a bullet in the mail of MP Benoit Potterie, accompanied by the words: "Next time it will be between your eyes". Six matches in the top tier of France's football league have been postponed. The Louvre, Musée d'Orsay and other sites are closed in Paris. Mayor Anne Hidalgo issued a plea: "Take care of Paris on Saturday because Paris belongs to all the French people." Its core aim she says, to highlight the economic frustration and political distrust of poorer working families, still has widespread support. An opinion poll on Friday saw a dip in that support, but it still stood at 66%. Prime Minister Édouard Philippe met representatives of the movement on Friday to try to start a dialogue. The seven protesters who attended welcomed the gesture. They were moderates who have urged protesters not to descend on the capital. One of them, Christophe Chalençon, said he hoped President Emmanuel Macron would "speak to the people of France as a father, with love and respect and that he will take strong decisions". President Macron has seen his ratings fall amid the crisis and is planning a national address next week, his office has said. Some have criticised him for being too low-profile. He has been called by some "the president of the rich".